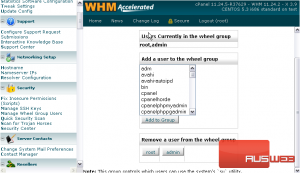 Placing someone’s username in the wheel group on a Linux system enables them to switch users when connected to the shell (assuming they have the user’s password). 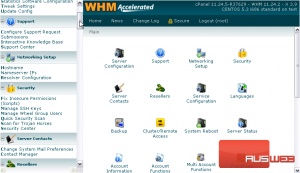 This includes the root user, which has complete access to your server. You should thus exercise extreme caution when adding users to the wheel group; only add those users whom you trust implicitly, and add as few people as possible. Less potential avenues for a hacker to gain root access means less chance of it happening. 1) Find the Security section of the menu. 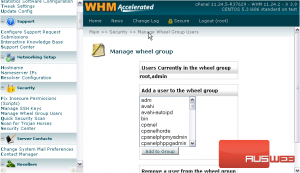 2) Go to Manage Wheel Group Users. 3) Select a user from the list to add to the wheel group. 4) Then, click Add to Group. The user has now been added to the wheel group. 5) Return to the previous page. 6) To remove a user from the wheel group, click the button with the user’s name on it. This is the end of the tutorial. 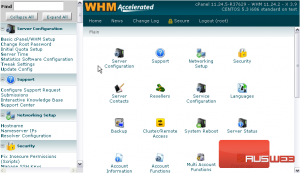 You now know how to manage wheel group users in WHM.